It's getting hot down here in Florida. This means it's time to break out the shorts, flip flops, sunglasses, and salads! I love salads, they're a great way to stay cool, add in healthy foods, and they can be a side dish or the main course! I also love Mediterranean food, so I wanted to introduce you all to one of my favorite Mediterranean dishes, Tabbouleh (or Tabouli). This salad is packed full of delicious herbs and vegetables. It's also a great way to sneak in some wild greens and healthy herbs that we don't normally have in our diets. I'm going to give you guys the traditional Lebanese recipe (handed down by several of the little old ladies at my church) and then give you a few variations. So here we go! This is the basic salad, though I tend to make one huge change for my gluten free friends. Instead of Bulgur, I use Quinoa. It has a similar texture without the gluten! Plus it's full of healthy protein which is a major plus for my vegetarian friends as well. Wash and roughly chop the parsley and mint leaves, discarding the stems. Lay on a clean towel to dry. Soak the bulgur in hot water (or cook your quinoa) for about 20 minutes. While wheat is soaking, finely dice tomatoes and onions. Combine the herbs and vegetables in a large bowl. Drain the wheat (or quinoa) and add to the bowl. Add lemon juice, olive oil, salt, and pepper. Toss well, to completely combine, and cover. Place in the refrigerator for 30 minutes or more. This recipe takes the basic Tabbouleh and throws in a lot of the fresh vegetables that may come from your garden (or the grocery store). I love adding in cucumbers and radishes for a nice refreshing snack. Wash and roughly chop the parsley and mint leaves, discarding the stems. Lay on a clean towel to dry. Soak the bulgur in hot water (or cook your quinoa) for about 20 minutes. While wheat is soaking, finely dice tomatoes, onions, garlic, radishes, cucumber, and peas. Combine the herbs and vegetables in a large bowl. Drain the wheat (or quinoa) and add to the bowl. Add lemon juice, olive oil, salt, and pepper. Toss well, to completely combine, and cover. Place in the refrigerator for 30 minutes or more. This variation combines some herbs and veggies that we associate with southwestern cuisine. This one might not retain much of the original tabbouleh flavor, but it does retain the tabbouleh spirit. This recipe varies quite a bit each time I make it. Largely due to the amount of wild foods in it. For information on what wild greens to choose, check out a previous post of mine here, check out Green Deane's Eat the Weeds, or check out this super helpful post here. Wash and roughly chop the parsley and wild leaves, discarding the stems. Lay on a clean towel to dry. Soak the bulgur in hot water (or cook your quinoa) for about 20 minutes. While wheat is soaking, finely dice tomatoes, onions, and betony. Combine the herbs and vegetables in a large bowl. Drain the wheat (or quinoa) and add to the bowl. Add lemon juice, olive oil, salt, and pepper. Toss well, to completely combine, and cover. Place in the refrigerator for 30 minutes or more. Yes, asparagus in tabbouleh is awesome. I love asparagus and will try just about any asparagus recipe at least once. This one was a huge hit in my home. Wash and roughly chop the parsley and mint leaves, discarding the stems. Lay on a clean towel to dry. Soak the bulgur in hot water (or cook your quinoa) for about 20 minutes. In a small pot of boiling, salted water, blanch the asparagus for about 2 minutes. Cool in an ice bath, and chop. Finely dice cucumber, tomatoes, and onions. Combine the herbs and vegetables in a large bowl. Drain the wheat (or quinoa) and add to the bowl. Add lemon juice, olive oil, salt, and pepper. Toss well, to completely combine, and cover. Place in the refrigerator for 30 minutes or more. 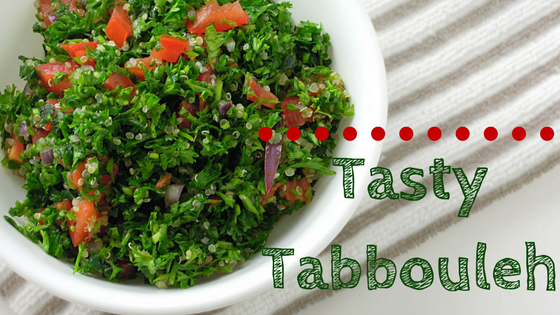 This variation takes tabbouleh, already loaded down with amazing nutrients, and pumps it full of many more tasty good things! Wash and roughly chop the parsley and mint leaves, discarding the stems. Lay on a clean towel to dry. Soak the bulgur in hot water (or cook your quinoa) for about 20 minutes. While wheat is soaking, finely dice cucumber, celery, tomatoes, and onions. Combine the herbs and vegetables in a large bowl. Drain the wheat (or quinoa) and add to the bowl. Add lemon juice, olive oil, salt, and pepper. Toss well, to completely combine, and cover. Place in the refrigerator for 30 minutes or more. Toss in the nuts just before serving. In any of these recipes, feel free to change the ingredients around. Play with different fruit, veggies, and herbs. Use Amaranth instead of Bulgur, try Red Wine Vinegar instead of Lemon Juice, add in some grilled Shrimp or Chicken. Have fun, play around, and let me know what you think below!